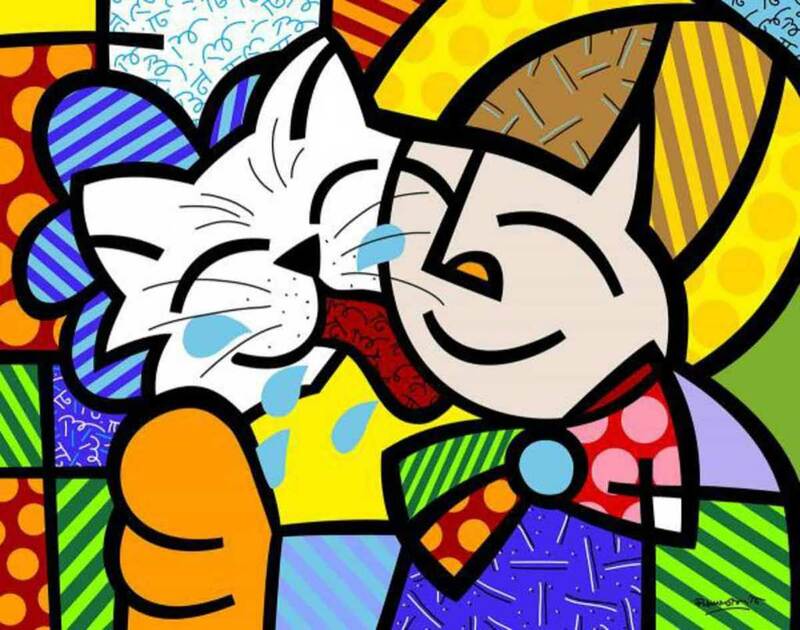 A few days ago, Miami’s galleries along Lincoln Road and downtown pulsed with the speedy strokes of Miami’s latest pop art sensations: Skyler Grey, Alec Monopoly, Gold Man, Santlov and Miami Beach’s most ubiquitous art mascot, Romero Britto. Downtown, an über-babe in a body-con dress motioned toward a series of varathaned collages stenciled with dollar signs, other people’s cartoons and luxury logos, glitter and superheroes. On the street, the neo-cubist heart, flower and smiley face sculptures of Romero Britto colourblock Miami’s boulevards, children’s museum, restaurants, housing complexes, metro rail station and even the interstate off-ramp. In what the ad-men call, “frequency and reach,” these technicolour cairns blur artist, message and locale into one big brand. In Miami Beach, the brand is Britto. 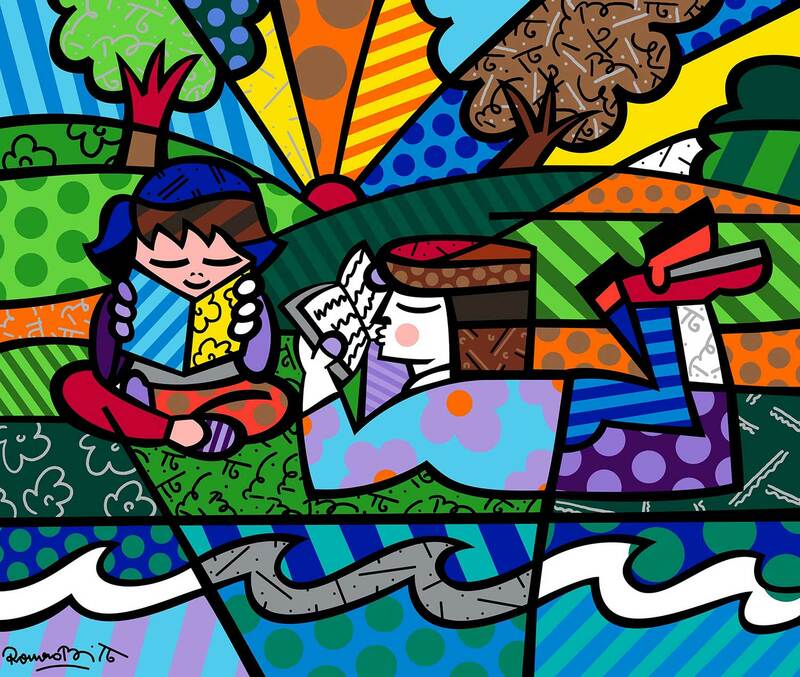 Romero Britto was born in 1963 to a single mother and grew up with his eight brothers and sisters in Racife, in Northeast Brazil. He painted on newspaper and cardboard scraps and dallied in law studies before moving in his twenties to Europe, then Miami to pursue a career in art. In 1989 Romero was invited to participate in the Absolut Vodka bottle campaign, exposing his colourful, cute motifs to millions. After getting involved in local charities, he met the stars of Miami’s entertainment and political glitterati including Gloria Estefan, David Caruso, Jeb Bush and Ted Kennedy, who became early collectors and friends. Our thoughts are with all of the people affected by Hurricanes Harvey, Irma, Jose, and Katia. I like this letter. 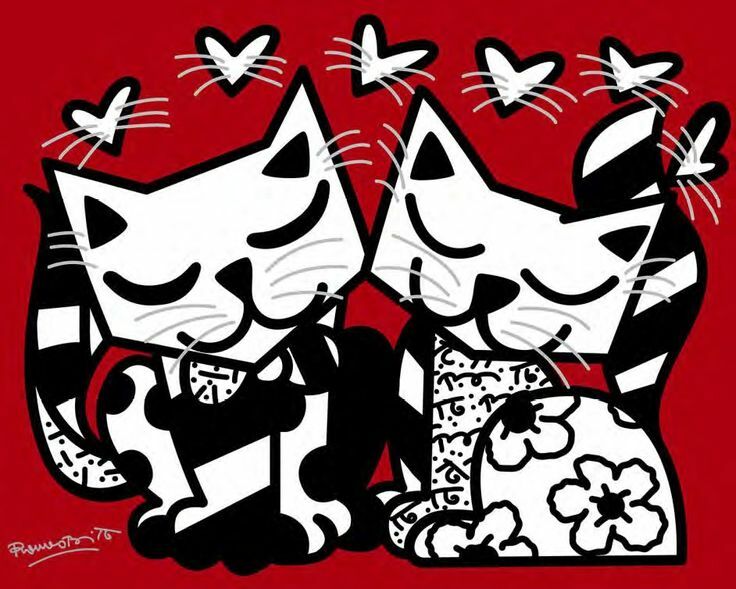 I agree with Romero Britto that most art should be beautiful, colorful, inspiring. Because it gives us a balance from frustrating or painful realities that every human being deals with. And yes, prayers for the people in Florida, Texas and the southern U.S. Thanks, Sara. There’s art, the art world, and the real world, best to know the difference. I would love to know what your definition of these three are. My thoughts and caring and positive vibes are with all those who have been affected and will be affected by this devastating hurricane. Stay safe. Thank you for your inspiring letters Sarah. They have meant a lot to me over the years. Happy Art! It is colourful and Miami is a colourful place. I have to agree with Kyle: “He’s a businessman, and he’s in the business of creating pieces for developers to plop in front of glorified strip malls and for tasteless rich people to hang above their sofas.” However, “in the end of the day,” Britto’s work seems more horrifying than inspiring to me. So maybe we should listen to the art and not the artist. While I am not a fan of this style of art I found appreciate many are…..it would be a shame if there was not diversity. There is commercial art and fine art. When the two meet you get Britto. Before him there was Keane and Thomas Kincaid. They are art with a limited time warranty; best not to pay too much for them. Had a boss that was the largest regional collector or Leroy Neiman prints. He stored multiple copies in vaults. He’s lost his tush on that folly. My thoughts and prayers also go out to the folks who are experiencing these hurricane devastations. Having said that, I read your article with great interest, Sara, as I had never heard of Romero Britto. The comments by critics as to whether his work is art, or not, were puzzling to me. As I viewed the photos you posted, I was once again in awe that someone can create pictures like that out of his or her imagination. I can paint it if I see a photo or a scene. But I can’t even draw or paint a rabbit unless I actually see it or a picture of it. I have the greatest admiration for anyone who can bring forth images that they haven’t ‘seen’ and put them on canvas or paper. Simply amazing to me. 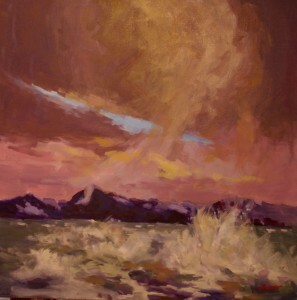 My first instructor – drawing – was Janice Tanton http://www.janicetanton.ca/ She also creates paintings ‘from her head’. Take a look at her Crazy Like the Moon and Beyond a Shadow of a Doubt. A completely different format from Britto’s but nonetheless incredibly gifted. Magical even. And you’re right: Says who? “Art” is determined by the viewer. Not the artist. Not the critic. Britto is bright, playful, colourful and not for me. For me, it is like a cartoon and I might buy it as a decoration on a coffee mug. I do not mind him bringing fun to the world and making money for doing it. More traditional forms of art can also be bright, playful, colourful and light up a room. More traditional art can alert people to environmental and social concerns and still bring optimism and beauty to a room. It does not have to be full of despair as Britto suggested – and that is what rubs me as it sounds very arrogant from someone who has become rich thanks to the big names of Miami. I hope he is paying it back in some ways. Of course, what is the job of the artist has been debated long before Da Vinci. Was he not more successful when dressed as a clown in the Courts of Europe than as an artist? Yet, he led the way for his observations of the environment, of social class, of religion. Only long after his death were his visions shared and understood. But an artist has to eat, right? Just hope he shares some of his fortune in good ways, as well. He could help out those poor folk in Miami and southern Florida who are suffering through Irma! Here we are today, faced head-long with bomb taunting dictators, natural disasters all over the US and around the world, and artists disagreeing on what is real art!! Didn’t Matisse say something like he worked his whole life to paint like a child?? Isn’t everyone free to express their unique spark of Divinity any way they want, as long as it doesn’t hurt anyone else? This isn’t my kind of art making , but so what? The public is inundated by instant images of death, destruction, political threats on every side… Maybe people find this colorful, playful, and cartoonish work a mental chloroform, enough to distract them into a sense of well being. So he’s made millions…I like the quote by Loretta Lynn, ”The definition of success is to be FIRST, BEST, OR DIFFERENT” He’s a positive force in a sea of negativity. He ups the happiness quota, says me!! It might be art but it is definitely not inspiring………. I asked myself why I don’t like this art. What is it that is bothering about it. I think it is that it does not communicate anything to me, not even jolliness. Actually I find something a little creepy about it if anything. Smiley, kitteny, candy blocked in with that heavy black line. I could feel no joy, not even any fun. I can see that’s what it is trying to do and when I try to connect with it on it’s own terms I am left cold. On paper, the visual language should work…the colour and big shapes and graphic explicit descriptions of loving emotions, but I don’t believe it or trust it. I can find no humanity, I can not engage or have a conversation with it. I agree with you, and why I don’t like it is that it is decoration, cartoons – not Art, which transforms, not placates, the viewer. Keep his art “non-invited” to art shows and galleries. He can content himself with his millions. I suspect similar comments were made about Picasso’s ‘Guernica’. Guernica certainly isn’t a smiley face face production. It was created as a response to the ugliest side of human behavior by a person who studiously avoided involvement in the fray. I’ve come to believe that popularized art is made popular by aggressive marketing and aggrandizement more than by talent or association, although it helps immensely to wear the right tie. Is it art….or is it ego? Like all capitalist ventures, it’s only valuable if you can sell it. Good letter, Sara. I remember your father saying that the art world is wide and big enough for everybody. I agree with that. The definition of what art is, in my opinion, is personal. When I walk into an art gallery, I decide what, if anything, I will take home and make it a part of my life. The issue of public art choices is interesting. Sometimes I come to enjoy things I didn’t think I would. More than anything art for me is a dialogue – something to internally adore, appreciate or argue with. I’ve walked by Brito’s gallery on Lincoln Road many times. 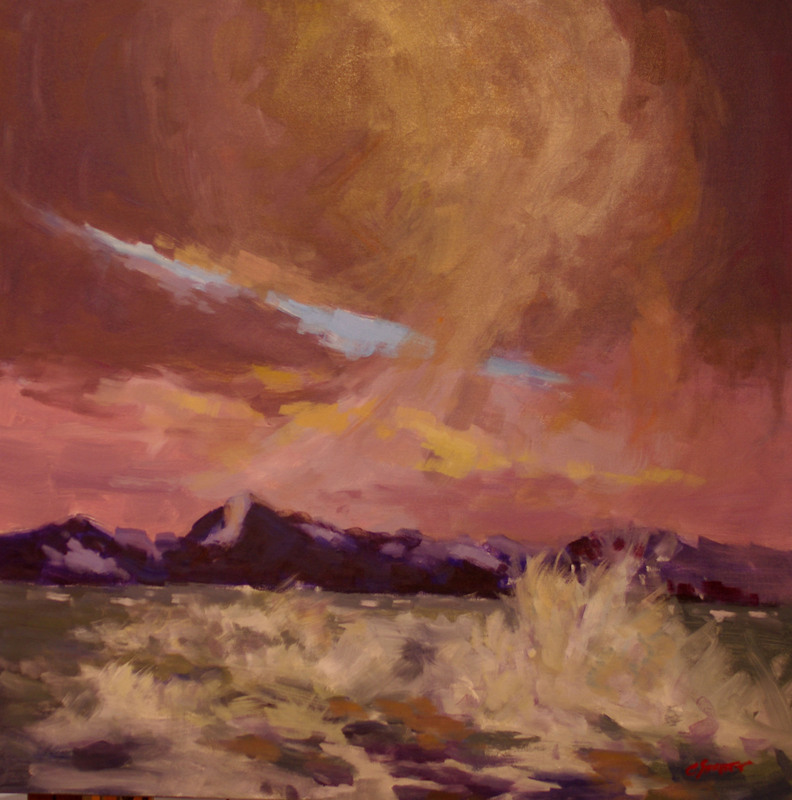 As a painter myself, and curious, ventured in once or twice. It’s very commercial. He’s very successful, well established, reminds me of Disney characters, brilliant in that sense. Nothing wrong with finding the thing you are good at and doing it, as an artist or any other professional. CAROL, TATJANA AND DONNA EXPRESSED MY FEELINGS ABOUT THIS ARTIST….ARTISTS SHOULD BE ALLOWED ANY STYLE OF PAINTING, AS THERE IS ALWAYS SOMEONE OUT THERE WHO IS GOING TO LOVE IT OR HATE IT….THERE IS NOTHING WRONG WITH HIS IMAGINATION…..THERE IS NOTHING WRONG WITH HIS SENSE OF DESIGN, OR COLOR…IF HE IS DOING SO WELL THERE ARE MANY PATRONS THAT KNOW NOTHING OF WHAT IS GOOD OR BAD IN ART, WHO FIND IT PLEASURABLE AND COLLECTING IT FOR THAT REASON ALONE….IT GIVES THEM PLEASURE…..WHY DOES GRANDMA MOSES GET SUCH GOOD PRICES AT AUCTION…..SHE WASN’T AS GOOD AS BRITTO, AND DIDN’T LIVE LONG ENOUGH TO BE DISCOVERED….BRITTO HAS. As I pondered what might be so attractive about these works as “art” to so many, it occurred to me that perhaps it has something to do with the consumers themselves whose artistic taste is digital light years different from their parents . Many grew up with color tv, computers, hand held electronics, gaming, anime comics and movies, tattoos and Hello Kitty. Where I live in the Silicon Valley, a lot of 20/30’somethings are making 6 figures. They consume art, and this is art to them. It makes them feel good. It reminds them of what they know to be true. I can’t relate to the art, but I can relate to the reason for it. 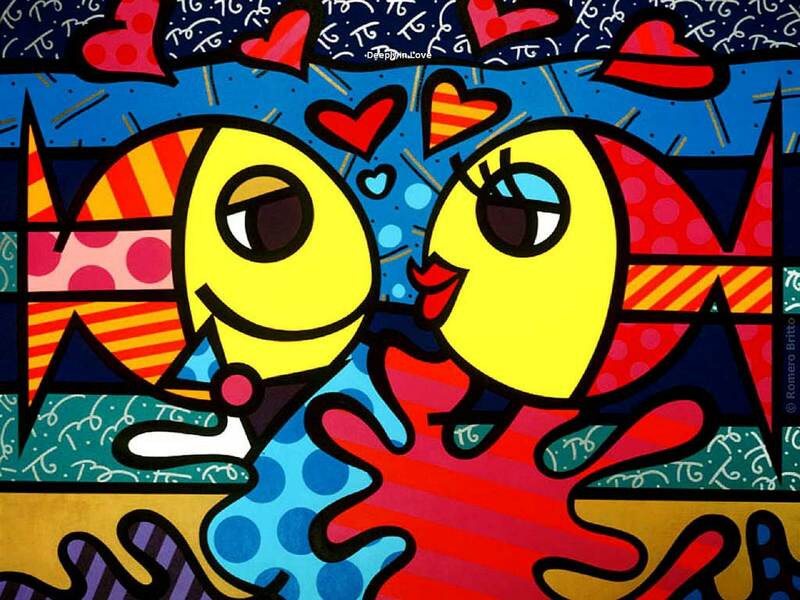 So, I surprise myself here by saying … Well Done, Romero Britto. Some people fail to understand the appeal of artists like Britta and Thomas Kindkaid it’s simple ! A simple appeal to the heart and unsophisticated taste , call it Kitchze if you want. Is not art much like love? Can there be too many kinds of it? Who has the right to say what kinds are not valid? We can, and should, speak only for ourselves. There are as many kinds of art as there are of Jack Russells, but I’m all for the idea that art should lift the spirits, no matter what the genre, especially in these unsettling times. 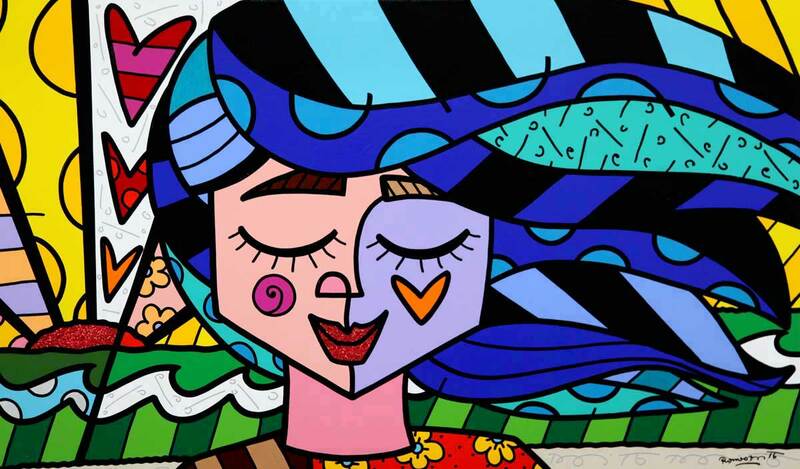 Having spent the week tuned into the news about Hurricane Irma and making plans to deal with this situation, should it affect our area in South Carolina, I have to say seeing Romero Britto’s cute and colorful creative works has lifted my spirits. While I agree, there’s a difference between ‘fine art’ and ‘commercial art’, any artist would have to agree that as a commercial endeavor, Britto’s done a remarkable job of marketing and selling his work, as well as gaining recognition for doing so. I’d imagine there are plenty of parents or parents-to-be who’d love these pieces for their kids’ rooms/playrooms, daycare centers and other kiddie places must love it, too. Whether people consider this work as ‘fine art’ or not, it IS his original creation and these are his vision. Remember, Norman Rockwell wasn’t recognized as a ‘fine artist’ as many illustrators are not, but today his work is quite loved, admired, collected and imitated. I think there’s plenty of space for all of us artists! Actually not a response to this topic, but I’m taking this chance to let you know about a NFB film made in the 1960s starring Frederick Varley himself: a brief retrospective, a look at some of his sketches and famous paintings, and a few minutes of the artist at work. A charming film, not the usual doc. 16 minutes long. Been “doing” and studying ART for 55 years, and teach painting at a large retirement facility for people 62 and over. I start with a new student by first giving my simple definition of ART. Art engages the eye, then the mind. To me if it does that, it’s ART. There are all l kinds of flavors of art. This is an expanded version of the old thing “Is commercial art art?”. Forty-five years ago this argument was being beaten up over coffee and smokes in the art college lounge by both creative and commercial students (something about the names of the two streams may give away the college’s position). In fact it was about this time some of the creative types came through and tagged commercial art students’ work with ‘not art’, ‘trite’, and ‘garbage’ labels. That caused a bit of a stir. But it did encourage thought. The issue of what constitutes art begged to be resolved and I believe each did, in their own mind, resolve for themselves what art is. No one has the authority to set a definition. Each new individual needs to find their way. It’s a mile stone in understanding that, I think, marks a firm standard for your efforts, a goal to work towards.